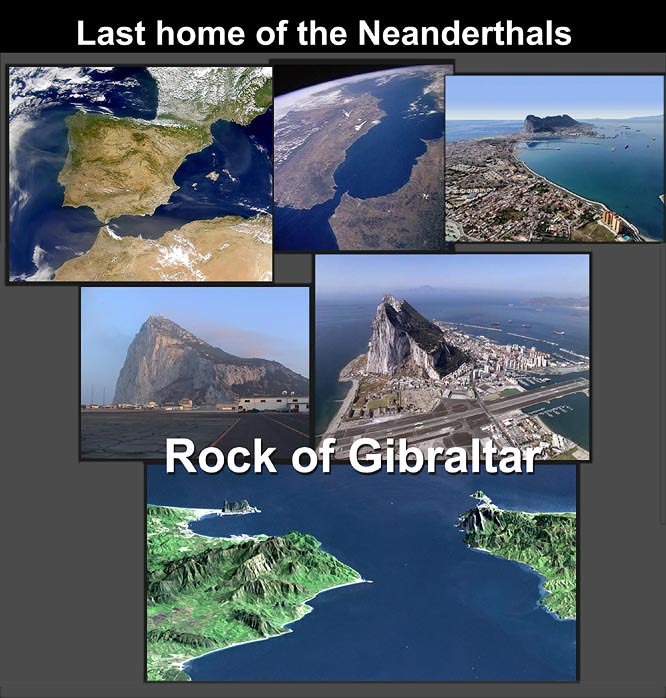 The Rock of Gibraltar was the 2nd place after Germany that Neanderthal evidence was found. The last surviving Neanderthals lived there. 25,000 BC. Gibraltar's Zafarraya remains the youngest evidence of Neanderthals and have expanded the timeline of Neanderthal existence. Newer remains in Spain suggest Neanderthals were driven out of Central Europe by modern man to the Iberian peninsula where they sought refuge. "NeanderDaniel is traveling tonight on the plain, I can see the red torch lights heading for Spain. NeanderDaniel, my brother, you are older than me, Do you still feel the pain of the scars that won't heal?" Poor Neanderthals - hounded out of Europe to their last cave. Broken limbs recovered but not broken hearts. Today people have swum across the Straits of Gibraltar to Morocco but for whatever reason the Neanderthals didn't make it.